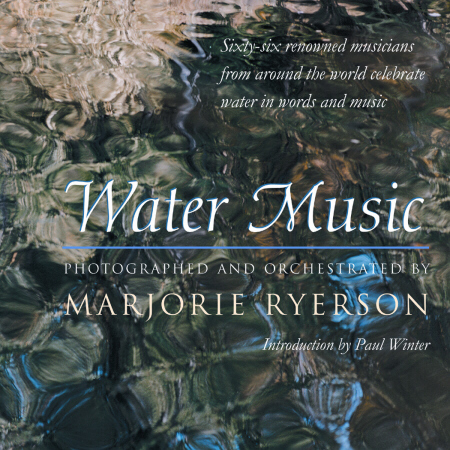 Photographer and author Marjorie Ryerson’s remarkable new book Water Music contains her photographs of water interspersed with writings about water by sixty-six outstanding musicians of today from across the musical spectrum. The musicians in the book include such world-class artists as Bobby McFerrin, Vladimir Ashkenazy, Midori, Dave Brubeck, Mark O’Connor, Taj Mahal, Renée Fleming, Sarah Chang, Pete Seeger, Mike Gordon (bassist of the band Phish), Brad Mehldau, Carol Maillard (of Sweet Honey In The Rock), Randy Newman, and many others. These musicians, from 22 countries, contributed a beautiful collection of memoirs, poems, anecdotes, song lyrics, and thought-pieces about the magic of water and its inspiration on their lives and their music. Pianist Michael Arnowitt collaborates with Marjorie Ryerson on a special live performance of the concept behind Water Music, alternating his performances of water-related piano music and her readings about water drawn from the book. Some of the musical highlights of the program include Debussy’s Reflections in the Water, Ravel’s The Fountain, Chopin’s Barcarolle (boat-song), improvisations on the jazz standard Here’s That Rainy Day and Brad Mehldau’s arrangement of Nick Drake’s River Man, an excerpt from the Chinese composition Red Lake, and Frederic Rzewski’s Down by the Riverside. If facilities exist, a show of Marjorie Ryerson’s framed photographs and/or a PowerPoint display of water images is available to exhibit in conjunction with the concert. Ryerson is donating all her net royalties from sales of Water Music to a special fund for water projects at the United Nations Foundation, established at Ryerson’s request. The Water Music Fund will be used to improve the natural health of bodies of water and to help provide clean drinking water to families around the world. Marjorie Ryerson’s book (published by the University of Michigan Press) has been hailed as a fresh new approach to raising societal awareness of the important water issues facing us today. She gives Water Music presentations around the world with musicians represented in the book and other artists. Her project has received the enthusiastic support of arts and environmental organizations, musicians, and governmental officials excited by her cultural look at our planet’s most essential element. Music: Jazz improvisation between verses.